Established in 2002，Guangzhou Car Knight Electronic Co. Ltd. is located in Baiyun district, Guangzhou, (factory in Baoan district, Shenzhen city) with a talented professional team, the lean manufacture system and the excellent quality assurance system. Guangzhou Car Knight Electronic Co. Ltd. is a large-scale Hi-tech enterprise specialized in R&D, production & sale of Car VA entertainment system, car security devices, and the other electronic products. 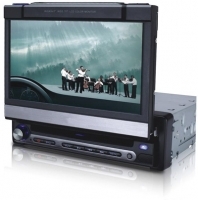 Throughout four years in the in-car electronic industry, our products range reach to Car CD/VCD/MP3, MP4,Car DVD, Portable electronical gadgets, back-view TFT-LCD monitor, Headrest monitor, Sun-visor monitor, Rear-view camera, HID Conversion kits, GPS navigation, parking sensors and Digital photo frame etc. We persist in "Market-oriented, R&D innovation, Excellent quality, Focus on customer" as our company tenet. Car Knight will certainly make greater achievements in the competitive International market and offer best services to each of our esteemed client. With the best products and services, we sale our products to Europe, America and Southeast Asia etc. OEM,ODM and small orders are welcome!